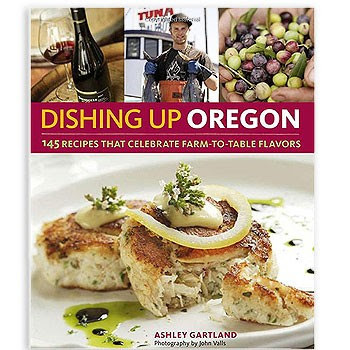 Dishing Up® Oregon might go down as being my favorite recipe book of all time. No, I'm not kidding. Every recipe that we have tried from here has been positively delicious! 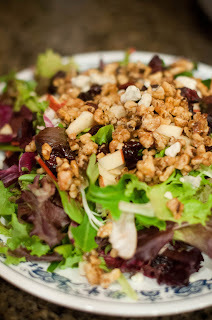 We've tried several of the recipes within including the Mixed Green Salad with Cranberry Vinaigrette (picture of my personal salad included here on the right! ), the Fettuccine with Caramelized Onions, Zucchini Ribbons, and Walnuts in Yogurt Sauce (using my own homemade yogurt to boot! ), and the Molasses-Ginger Stout Cake using local Stout. (W-O-W!!!) We might have also dumped some fresh homemade icecream on our cake, because that's just how we roll here. This book sort of takes you around Oregon, to the farms, wineries and coastline and offers recipes from each region. I have to say, I don't even like seafood but I'm seriously tempted to give some of their seafood recipes a go. (My five year old would adore me forever if I would!) You can find simple recipes in here as well as much more time-consuming ones. It includes everything from how to roast tomatoes to Lamb Meatballs Stuffed with Swiss Chard and Goat Cheese. I'm looking forward to peaches being back in season around here, for then I shall try out the Peach-Herb Salad with Pickled Red Onions and Balsamic Viaigrette. (YUM!) This next week I'm planning to make the Pear-Pepper Chutney (with a few spare pears I found at Trader Joe's) and I'm fairly certain that's going to be well-received around here. Happily, I also recently discovered a source for lamb so I'm going to have to give those meatballs a go. Yes, yes! SO many yummy things to make and eat! I love creating things in the kitchen for my family to enjoy and this book helps me do just that! I'm lovin' it! (And so is Jonathan, for the record!) The kids are eating along with and can at least say that they are being well-fed if nothing else! (They didn't complain too loudly about that fettuccine dish though, let me tell ya!) We have them try it all alongside us to broaden their palates and so we can all enjoy a fine meal. It's fun. If you would like to leave one extra comment for an extra entry, you can "Like" Storey Publication's Facebook page. If you "Like" them, leave another comment on this post saying so. Thank you, Storey Publications, for sending me a copy of Dishing Up® Oregon to try out on my family. We appreciate it! Although we *average* Americans might not have quite as cultured palates as you hip west coasters ;-) , this sounds like something I would enjoy! I love food. I love Oregon. Therefore, I must love this book. Sounds great! Oregon is on my bucket list, and I tend to choose my destinations on what culinary delights they have to offer! Like Eat, Pray, Love but without the pray and love! Oh my goodness, Carrie. Reading this made me hungry, and I really want that stout recipe! Oh, I'd really like to try those salad recipes in particular! This book looks like fun! And I'm curious about your lamb resource? I would love this cookbook. I have been collecting cookbooks forever, and this would make a great addition to it. I wonder if I will still be eligible to win if I suggest a correction to this post?! :) If something is clear full, it is "chock" full, not "chalk" full. I enjoy reading your posts and often check to see if our library carries books that you have reviewed that piqué my interest. Oh, I love food, I love books, I love cookbooks. Yes, please! Please enter my name. ...and I liked Storey Publications on FB. Thanks for the chance! I've never visited Oregon so I'd love to learn more about their farms, produce, wine & food. I'd love to win this book! Grew up in Oregon, currently live in Washington. Our vacation to WA and OR several years ago was one of our all time favorites. I think N would live there if he could. (Although we visited during the sunny part of the year.) I would love to try this cookbook since I try to add variety to our meals. YAY!! So excited, I am. Thank you, Carrie and Storey Publishing. I received the cookbook today. It looks lovely. I'm on a juice fast right now so I can only look, but I'm eager to try the recipes. Thanks again to you and to Storey Publishing.